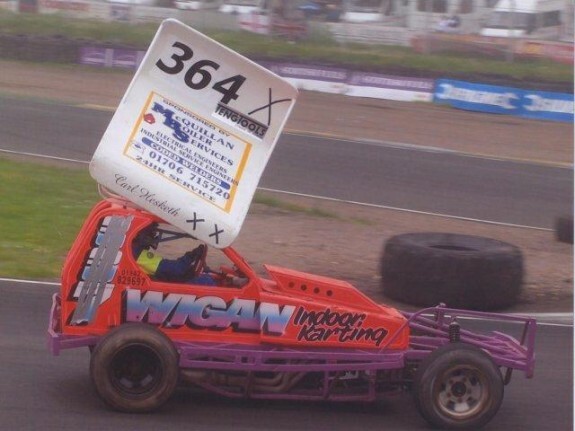 After watching F1 stock car racing for almost 30 years, I finally got to experience driving one for myself after Dave Willis had generously offered me the use of his car. I will admit to some trepidation when I got into the car, as I was going to do my novice driver’s five laps under supervision without ever having driven the car before. 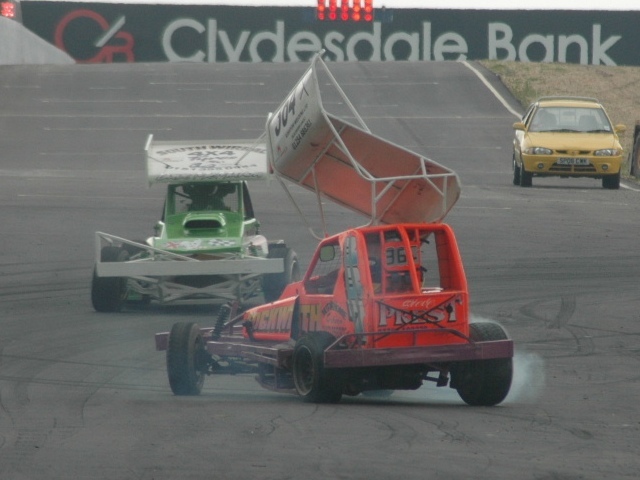 Not just this car, up until that point I hadn’t driven any stock car or other racing car of any kind. The clutch was heavy and ferocious, so just driving the car through the pits was a bit tricky. After stalling it once, I set off towards the track, and found a Transit with a trailer performing some sort of reversing manoeuvre right in my way. I could have got round it, but there were loads of people about and I felt that running a few spectators over might have a negative impact on my overall day. They eventually got out of the way, and I joined the queue to go out on track. There were a couple of practise sessions plus another round of the two-seaters before it was my turn. It seemed to take forever, but eventually the track was cleared and I was waved forwards. I drove through the pit gate and a big grin started to appear on my face. I couldn’t see anybody with any flags or any other officials telling me to stop or anything else, so I thought I’d just get on with it. A little bit more on the gas pedal, and then into second gear. I pressed the accelerator down about half an inch, the engine roared, and the car shook and lunged forwards a lot quicker than I had been expecting. I was totally unprepared for the noise, the vibration, and the sudden blurring of the view. Alarmingly, there was a whining noise from the gearbox area, and I remembered Dave saying that with Doug Nash gearboxes, it was possible to select both second and reverse at the same time. Had I done that? Clutch back in, back in neutral, and this time I shoved the gearstick hard over to the right and then pulled it back. It still whined, so maybe that was normal. Round the hairpin and a bit more gas down the back straight,then a dab on the brakes. Not sure that the brakes actually did anything, but a bit more on the loud pedal. By now I was quietly giggling to myself. As I got towards the pit gate, there was nobody jumping up and down and waving for me to stop, so I stopped worrying about the whining and carried on. I did another lap and went marginally faster, and towards the end of the back straight I got the accelerator all the way down. Or so I thought. Coming into the last turn, I moved my right foot back towards me a bit to get more comfortable, and the next time I pressed the accelerator I found it went down a lot further than I had first thought. However, when I pressed it almost all the way down, the car shook and slithered about on the track, and I found myself heading towards the grass bank. Dave had told me that if I tried to put the power on too quickly, all that I’d do is light up the back wheels. Perhaps I’d given it too much too quickly? Having since seen it on video, that seems laughable, but I did the remaining laps with a more gentle right foot. 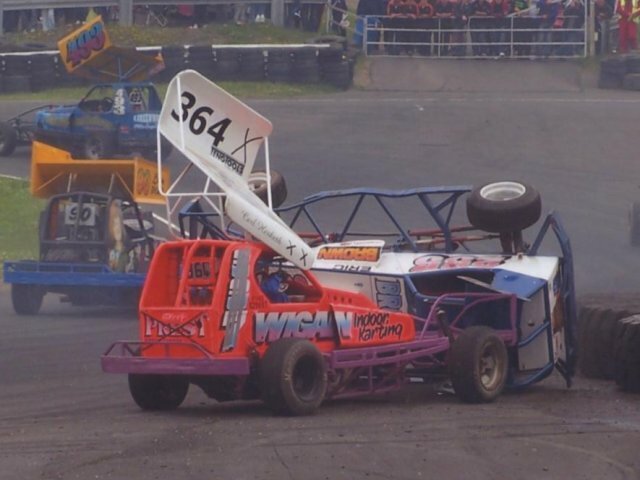 I gave it a few more bursts of full throttle, but each time the car tried to turn off the track, so I lifted off again. I’d always thought that the stagger on the back axle would make the car want to turn left, but mine seemed to prefer going right most of the time. I mentioned this to Dave afterwards, who explained it. “It’s the driver”. I was in the last of the practice sessions, and decided it would be best to start at the back. The thing that was instantly apparent when the session started was that everybody was much faster than I was. I now had the problems of trying to control the car while not getting in anybody’s way. Both easier said than done, but having other cars on track helped, as I could as least now judge my pace against them, and also see where they were braking and turning. After a few laps, I was feeling a bit more comfortable with controlling the car while putting the power down, so I started to increase the speeds and brake a bit later, although I was only getting the pedal all the way down for a second or two at a time. 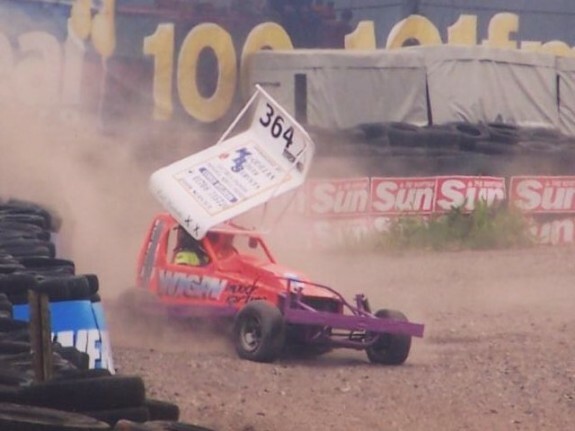 I’m not sure I got round any quicker, as I ran off the track and onto the grass a few times, and eventually ended up in the gravel pit after failing go get around the hairpin. So that was practise over and done with, next I was racing for real! I was in the second heat, and fortunately I was the first in the queue in the pit lane so I could watch most of the first heat while sat in the car. Well, I could have done, had a load of people not come and sat on the front bumper. The first heat seemed to take forever. Andy had said he’d come and strap me in when the lap boards came out, and I was starting to think he’d forgotten. As a novice, I was starting at the back, so I went out and took my place halfway down the back straight. A flag marshall came over to me and pointed at Paul Hines and Frankie Wainman Junior, who had gridded some way in front of me. I had to laugh when he said “Can you go and line up with the other superstars?”. Paul had joked with me earlier that Dave’s car owed his car one, and I should bear that in mind. So, I started it up and rolled forwards. I intended to just roll up to Paul’s car and give him a gentle nudge, but I stopped short by about an inch, oops. Paul had seen my coming and gave me the thumbs up, and shouted a few words of encouragement to me. I shouted something back, no idea what, and then the rolling lap started. I followed Paul around the track, put it in second gear when we’d almost done a lap, and then set off when he did. He just pulled away from me like I was standing still! I stamped on the accelerator, the car roared and shook and tried to turn off the track, but this time I kept my foot down. I gripped the steering wheel tightly and with a bit of turning to and fro, I got the car pointing down the track. But I had a slight problem, in that I was now at the start of the hairpin bend, and I had the car on full throttle. That gravel pit suddenly looked perilously close. Without really thinking, I turned the wheel left and stamped on the brake pedal. That momentary feeling of panic turned to one of euphoria as the car went perfectly around the bend. I was quickly back on the throttle, and went down the back straight with my right foot trying to push the pedal through the floor and a very large grin on my face. For the first time, I felt like I was actually in control of the car. But it didn’t last. I lifted off the gas for the second turn and realised I’d done it too early, so I didn’t bother with the brakes and fed the power back on as I went around the turn. I was about halfway round when I had my foot almost all the way down, and I think I tried to take the last turn too tightly or too quickly, or both. 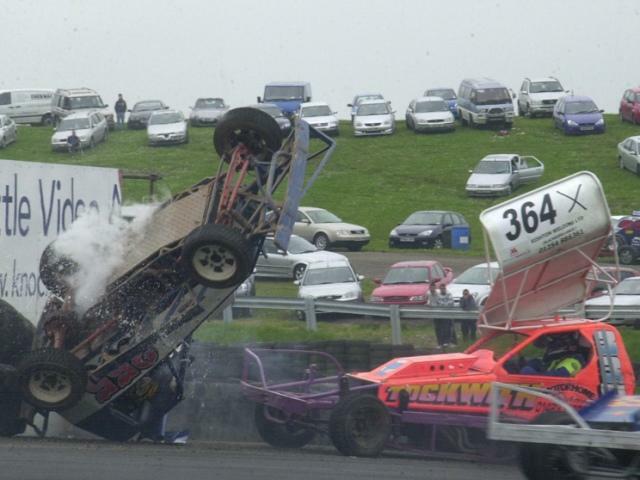 Before I even realised what was happening the car had spun completely around out of the turn, and I found myself on the infield. The problem now was that the rest of the cars were coming past me and I had no way of turning my head to see if there was a gap so I could pull out. I was wondering if I should reverse further onto the infield and rejoin the track further along, when there was a bang and the car turned. Tony Smith had come off the track with another car, and hit me. That was quite helpful, as I was now in a much better position. I still couldn’t see if anything was coming, but I could drive along the edge of the track and pull out, hoping that anybody coming would have chance to avoid me. I managed a few more laps, but I kept coming out of that last turn too wide, and usually ended up with the outside wheels on the grass area. Apart from one lap when I got the whole car on it. I was determined to get around that turn without going onto the grasss, so when I was again heading for the same bit of grass, I tried to steer away from it. This wasn’t a good move, as I turned a bit too much and found myself heading for the infield. I quickly turned the wheel back the other way, the back end came around and the result was a long sideways spin along the straight, with the car eventually stopping three-quarters of the way down the straight and facing the wrong way. For a few seconds, I just sat there like a rabbit staring at headlights. There were now cars screaming past me not that far from my front bumper, so getting out of the way was the main job. I thought I was closer to the grass on the outside of the track than I was to the infield, so my first idea was to reverse onto the outer edge of the track. The passing traffic didn’t look like it was very far from my front bumper, and as the front of the car would swing out when I reversed left, I waited for a gap. When it seemed like a good time to go, I floored the accelerator and lifted the clutch. Nothing happened. I hadn’t noticed that the engine had stalled. I fired it up, and just as I was about to go, Craig Finnikin went past me on my inside, closely followed by Simon Panton. I changed my mind and decided to go forwards onto the infield. I watched the cars coming around the turn and tried to gauge how far apart they needed to be to give me enough time to dive for the infield without getting clattered. I was all set to go when I noticed I’d be pulling across the front of Derek Fairhurst, and apparently I’d already got in his way quite a bit in the practice session, so I waited for him to get by and then went for the infield. I heard a loud banging noise as the car went onto the grass. Was that the car, or my heart? I turned so I was back facing the right way, then realised that if I kept going, I’d be trying to rejoin the track on the hairpin bend. Probably not a good idea! Another change of direction, and I headed for the back straight. 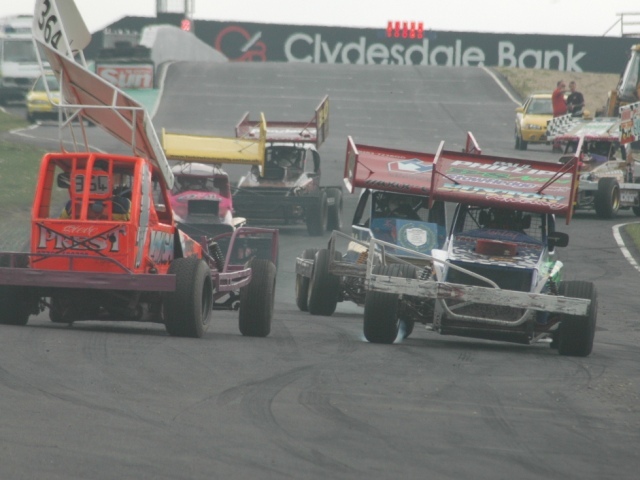 However, I didn’t quite get there, as the infield is bumpier than it looks and the car got beached in the middle. I span the wheels a few times and moved nowhere, so I turned the engine off and my first race was over. Back in the pits, there was no sign of anything broken, and Dave explained that when driving over rough ground, the fifth link on the back suspension can bang up onto something, which might have been what I’d heard. It didn’t seem long until the Consolation, and once again I started at the back. As soon as the race started, something seemed different, and I soon realised it was because I didn’t have my goggles on. There had been a delay before the race started, and my goggles had started to steam up so I had moved them up onto my helmet and promptly forgot about them. I managed to pull them down, and luckily they just dropped into place. I had now learned that if I had my foot all the way down before I came out of that last turn, then I was going on the grass. I alternated between foot-down-and-on-the-grass, and foot-half-down-and-on-the-tarmac, both of which meant I got overtaken by several cars each time I went around the turn. I got closer, but I don’t think I hit him, or if I did, I didn’t feel it. I’d got the line a bit better this time, and got the grass a bit further down than usual. This threw me a little, because I then ran wide around the hairpin, and got the outside wheels into the gravel. I got back onto the tarmac and as I’d seen a load of cars coming behind me, I stayed on the outside as I approached the second turn. I was getting to the turn and just about getting up to speed when another car suddenly appeared in front of me and slowed. There was a thud as my bumper hit his, which was followed by a massive bang. My car stopped dead. Things then became a bit surreal, as the car in front of me slowly tilted upwards vertically. In slow motion and in total silence, the car then landed on it’s side in front of me. I had no idea what had happened, but when a load of marshalls legged it off the infield to the overturned car, I began to feel slightly uneasy. It was an accident, but even so, I didn’t like the idea that I might have caused another driver some injury. One of the marshalls glanced across at me, so without thinking I gave him the thumbs-up. Then I started wondering, was I alright? I’d had the wind knocked out of me, but apart from that I seemed fine. More importantly, what damage had I done to Dave’s car? It wouldn’t start, so I was tractored off, and that was the end of my race. The other driver turned out to be Eric Brown, on one of his rare outings. After the race, I had a bit of a laugh with Eric’s mechanic, who I had mistakenly thought was Eric himself, as Dave and I went back to collect the car, although with his strong Scottish twang and my dulcet Lancashire tones, it probably wasn’t the easiest conversation for either of us. The distributor cap had jumped off, and the car started no problem once it was back in place. However, there was other damage. The bonnet was tricky to remove because the retaining pins had bent, the floor of the car had moved forwards by a few inches, and the steering wheel was bent. That was the car, the driver was suffering from a couple of problems too. My eyes were watering, one because I had got some dust in it from not having my goggles on for a lap, and the other because a contact lens had moved out of position, probably as a result of the impact. We then all wandered over to the terraces to watch the Final. This was the first time that day I had even noticed the starter, or where the finish line was. 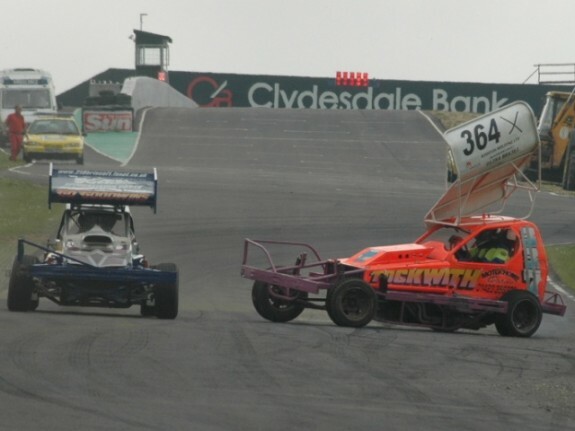 An impressive drive by Andy Smith saw him win the race, and after the flag he threw it sideways and smoked the tyres around the last bend. “That’s just showing off”, I thought. Back in the pits, I had a new set of contact lenses and a new steering wheel (the one from Dave’s car), and so it was back out to track for the GN. Despite the abrupt end to the last race, I was feeling a lot more confident by now, and decided that I should try to drive where I wanted without simply getting out of the way whenever I saw somebody coming. This lasted for almost a full lap, and then I saw Andy Smith coming in the mirror at a fair rate, and moved over sharpish. He came past me like I was standing still! Stu had told me that my main objective should be to finish, so with this in mind I decided not to try any more high-speed exits out of that tricky last turn. I did a few laps at a slightly lower speed than I had been doing, but found that the car now went where I wanted it to. More or less! But when Paul Hines went past me for the third time, I thought I’d better speed up a bit. As soon as I was on the home straight, I floored it. The engine roared, but the cars in front just pulled away. That’s when I realised that the clutch was slipping. I tried feeding the power in more gently on the back straight, but it slipped again and emitted a worrying rattling noise, so I pulled off and my first meeting was over. I couldn’t help but wonder if the clutch had been slipping slightly the entire race, and what I thought was my improved driving was simply down to the clutch not letting me put much power down. So that was my first meeting, and I have to say I loved every second of it. My Honda seemed even more boring to drive than usual on the way back home. Massive thanks are due to a lot of people for making it all happen, and I am extrememly grateful to the following. Dave Willis for the car and the helmet. Dave Russo for the aerofoil, transponder, balaclava, goggles, neck brace, and back brace. Steve and Neil of NSA Signs for the signs for the aerofoil. Roger Brown for the overalls, help with the signs, and the loan of the stove for brewing up. Sadly, in the excitement I forgot the coffee, sugar, and cups, so it went unused. Sylv, Kay, and Lisa, from team 337 for the hospitality, food, help, and the surprising lack of taking the mickey once I’d got in the car. Steve “Waz” and Paul Hines for helping me with the harness. (Even though Steve was supposed to be helping Mike Ashcroft). Everybody who came to say hello, wish me luck, or tell me I must be stupid. There were loads of them, far too many to contemplate listing. And my wife Tracey, for being there while I finally achieved a life-long ambition.